When we talk about caving in the Cordillera region, the popular town of Sagada in Mountain Province would first come to mind. That comes as no surprise. After all, Sagada’s limestone-covered landscape is dotted with at least four grand caves, each boasting of stunning rock formations. 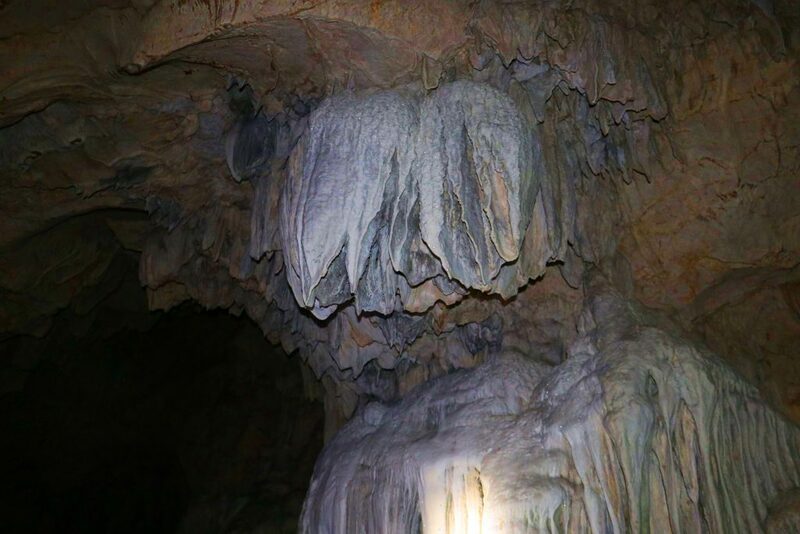 Now, if you have been visiting Sagada for a number of times already and would like to chase a new spelunking experience, why not try the caves in Benguet. Surprised? For all you know, Benguet is merely the home of the majestic Mt. Pulag or the famous Strawberry Farms in La Trinidad. But as I would always say, Benguet is much more than that. I have been visiting the different municipalities of Benguet, mostly taking off-beaten tracks. These led me to fascinating and rustic destinations of which the following caves are amongst my favorite. Yes, let me now take you to another level of spelunking experience amongst the caves in Benguet! Take note. I only included in the list caves which I personally visited and experienced. Expect me to add more in the coming months as I explore more of Benguet’s caves. Bengaongao cave is one of my favorite caves in Benguet. Located at Ambongdolan, Tublay, this earthen wonder is slowly hitting popularity, being among the featured destinations of Ms Gina Lopez’ ecotourism projects. Bengaongao literally means “noise” in the Ibaloi language which is mostly used by the locals. 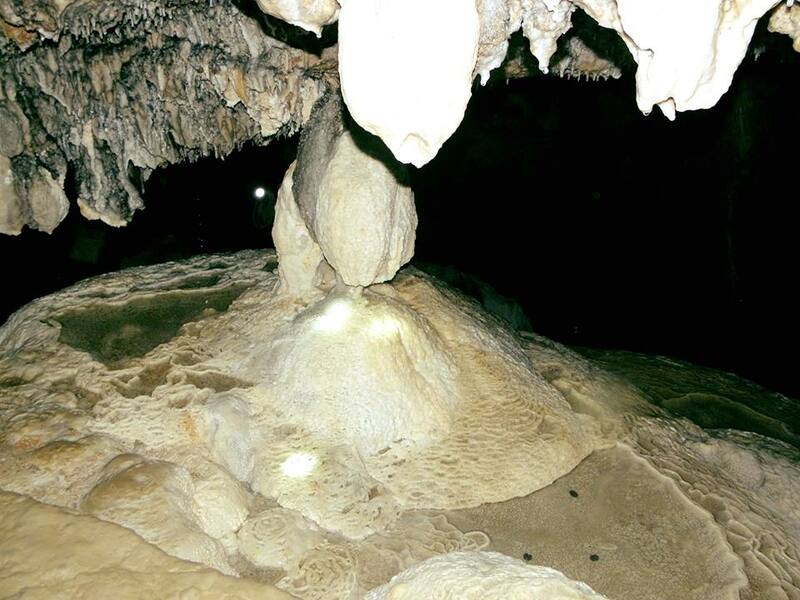 The noise is said to be created by bats which dwell inside the cave. Accordingly, Bengaongao cave is created by an underground river. It has a giant opening, reaching more than 30 feet high with big boulders on the side. As you go deeper, different stalagmite and stalactite rock formations await. The highlight of which is the so-called, “The Heart of Bengaongao Cave.” Well, the rock formation looks like a heart within the center of the cave and thus, the name. Once you’re done spelunking here, you can also side trip to Ketong falls, just some 15-20 minutes of hike along a river. 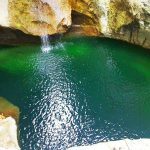 Paterno Cave is just some minutes of walk from Bengaongao Cave. Both caves are part of the 225 pesos worth of tour package organized by the local community. Compared to Bengaongao cave, Paterno cave is drier and shorter. It also has a narrow opening that you literally need to crawl on your belly to get inside. Bats are often sighted here. According to our guide, the cave got its name from a Filipino general named Paterno. Paterno hid inside the cave to escape the invading American forces. 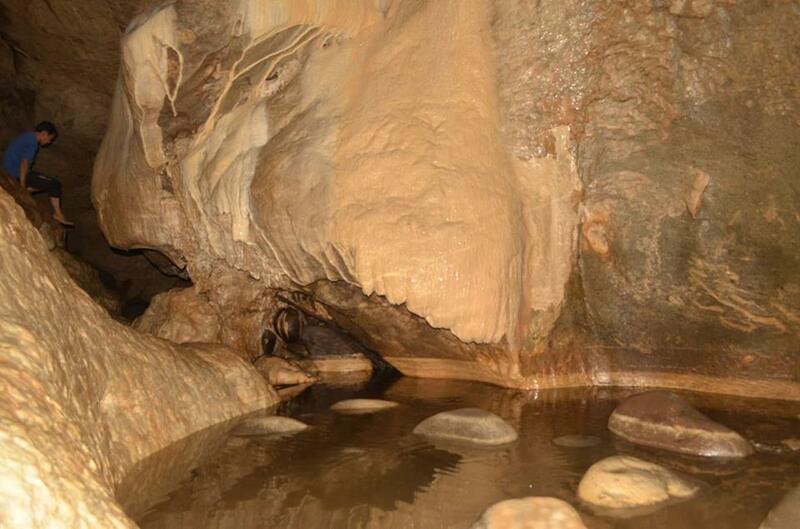 Such account makes this one of the historical caves in Benguet. One of my favorite rock formations here is one that is shaped like an elephant’s trunk. Interestingly, a priest celebrated a mass here with over 300 faithful during a Catholic holiday. One could just wonder how they all fit there. 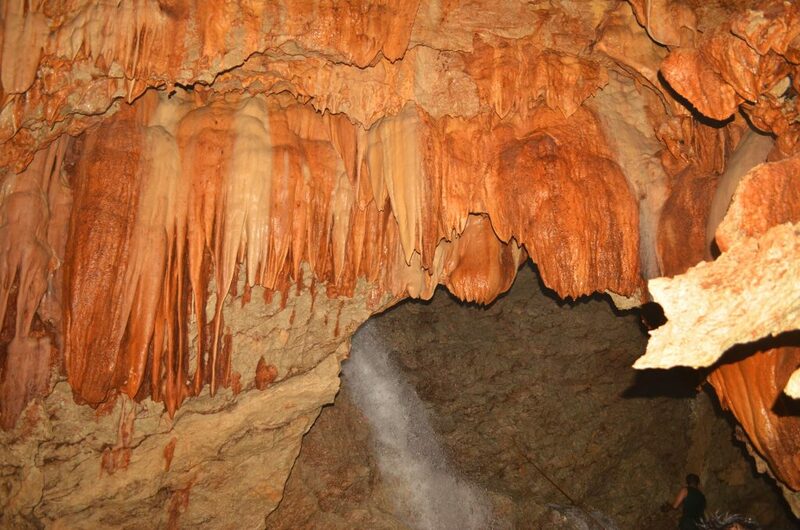 From my experience, Longog cave is one of the most accessible caves in Benguet. From the national highway, it takes just around 10 to 15 minutes of leisurely hike to reach the cave’s entrance. But just before it, there is a hanging bridge that you need to cross. Once reaching the cave’s mouth, there is a narrow slit of rock opening where you need to clamber across. After that, you need to climb down/rappel on a steep rock wall. It is not that high though. Then, some meters away, you will need to crawl on you belly to get across a small opening. So expect to get sandy or muddy. Wheew! Seems like a lot of humps and bumps to conquer. But as soon as you get passed these, brace yourself for wondrous sights of varying rock formations. Some of these rocks exude glitters, reminiscent of jewels. I would say that this is one of the mystical caves in Benguet. After all, it got its name from a legendary giant named Aran. Local stories say that Aran is responsible for the disappearance of some workers during the construction of the Kennon Road. But don’t worry. You will eventually forget such story once you get inside the cave. I should say that this is one of the most beautiful caves in Benguet. 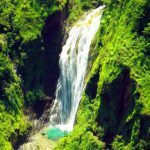 Aside from spectacular stalactites and stalagmites, there are at least three cascading waterfalls, each with deep pools. Just like in Longog cave, the waters here are icy-cold and crystal-clear. Of course, to get deeper into the cave, you will need to climb over these falls and wade on some pools. Therefore, expect to get wet. But get ready also to be cleansed and rejuvenated. Good thing, the tour guiding system is well-organized. If you need more information that may help in setting up your itinerary to the caves in Benguet, feel free to note them on the comment section below. You could also message us on our facebook page, Daniel’s Eco-Travels. Additionally, if you have been visiting caves in Benguet, you may recommend so and I would gladly add this on the list. Just make sure to give a brief description and a quality photo of it. If possible, suggest off-beaten caves. Thank you very much. Hi! My name is Daniel. But you can also call me Kumafor which is my indigenous name. I am a passionate traveller who loves climbing mountains and trees, chasing waterfalls, and celebrating culture. I belong to the I-Lias tribe of Barlig, Mountain Province. Oh, Im also a turtle investor. Get to know me more here. Sign Up for my Latest Travels! Grow your Money thru Stock Market Investing! Start your Way to Financial Freedom! Join the Truly Rich Club of Bo Sanchez. Copyright © 2019 Daniel's Eco-Travels. Powered by WordPress and Epic Base.